The place I had chose to sit was on a slope, my body weight was causing me to slide slowly downward toward a pool of water covered in green milkweed. “Be still!”, I told myself. I could not move a muscle and risk the opportunity of revealing my presence at this point. The watchful adult was shadowing her young and was just outside my peripheral view (I could clearly see that big solid red eye of hers). The overly excited youngling was several feet from my position. I suddenly found myself at nearly eye level with the juvenile bird. Lucky for me, I just happened to be in a perfect alignment with my lens already aimed toward the exact branch where the bird’s next attempt to land might take place; and finally… the bird made a giant leap for the tip of the small branch that protruded upward out the water’s surface! The old lens(no image stabilization) made good effort to capture several photographs. I occasionally shoot with older manual lenses. This method does run the risk of spoiling many otherwise good photographic opportunities. Processing the photos I was pleasantly surprised with the many hard and soft edge lines of the bird, the shadows in the photograph, the lighting and the composition of the subject that filled the monitor. The bold, outstretched wings, the colorful eyes of the excited juvenile, combined with its extended long legs, and protracted miniature talons provide a rather striking pose for the scene. Also, notice the animated looking wing lining of primary and secondary feathers blown and ruffled about by the rush of wind giving the rare appearance that the bird’s plumage looked as though it was airbrushed and painted with the finest oils on fine canvas. The image is truly one of nature’s best art presentations. It was interesting to observe how the Black Crowned Night Heron parent was acting as babysitter, coach, and mentor. Mimicking the parents own actions, the juvenile spent several brief minutes of poking its beak into the swamp water as though stabbing at some imaginary prey. Afterward a short while, the young juvenile flew off in into the direction from where it had originally started. 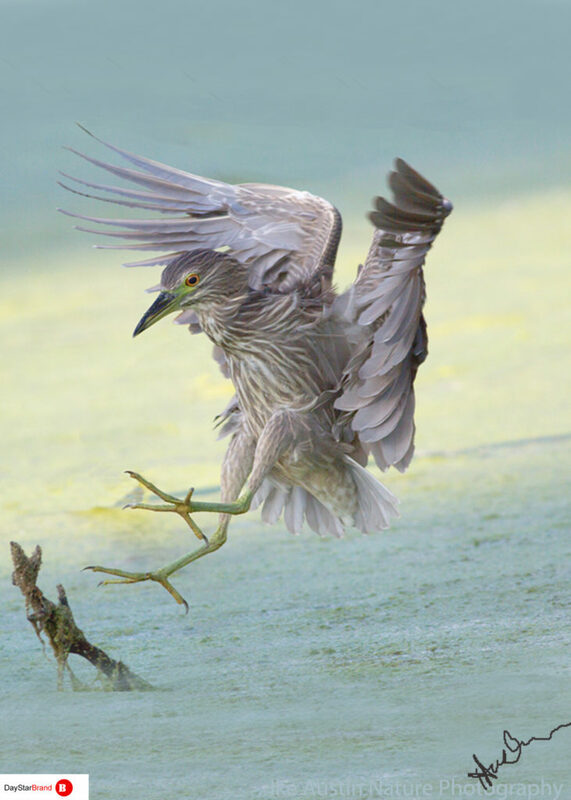 The ever watchful Black Crowned Night Heron parent quickly followed close behind. The soft bokeh in the image background is also key in highlighting the prominence of the subject in this picture. The neutral teal-beige colors provide a perfect complimentary range of blended warm tints and soft calming hues to enhance a variety of room decor and wall colors; light or dark. None of the photos I shoot are artificially induced; no scaring the birds into action. Nature favors a patient mind; if I must sit for hours, I wait for hours. No camera flash is used; only natural lighting utilized. No artificial props, staged shots; all scenery is raw organic nature. 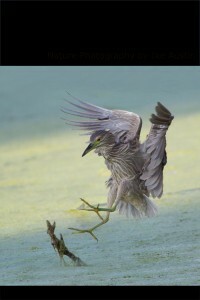 You are sure to have true raw organic natural exquisite photo art in your possession. The photograph art will be professionally printed on acid-free archival paper; fine Art Paper with a water-resistant vellum surface. It is made from 100% cotton fiber and is acid and lignin free. I will use only CERTIFIED Giclee printers. Giclee prints will not yellow or fade over time. All substrate paper sources will meet archival standards set by Fine Art Trade Guilds for pH and acid content and light fastness; you are assured of receiving the highest quality you are paying for. 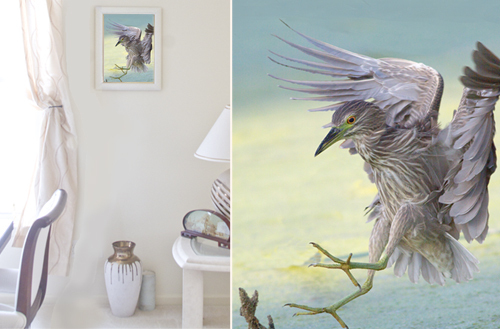 The gift version of the Black Crowned Night Heron print is framed in your choice of old world dark ire, or mahogany wood, or off white hardwood (unfinished). These gift versions of the print are packaged as follows; this fine print is protected and matted, sleeved, set/float inside convoluted foam to hold your artwork in place, placed inside a box ensuring that your photo art will arrive safely. 1 – Standard, Tubing: Strong cylindrical photo shipping tubes are used. 2 – Boxed: Can use box upon your request. All packages are insured. See shipping charges below. This exquisite piece of photo art, when hung on any wall in your home, will display a compelling composition of one of nature’s finest moments. The photo will attract the attention of all who enters into that room. What a great celebration of art produced by nature that can be a part of your home. Let a copy of this fine print be the connection between you and lessons from nature, the start of your personal… Dialog With Nature.